woman crowned with morning glories. save the blue sky across her face. his brain flooded with blood. our souls fused in a speck of eternity. What happens here will not be forgotten. almost strangers, yet closer than ever. As autumn deepens, he lives parallel lives. Unlike his body, he seems at peace. All I can think is, please God spare him. 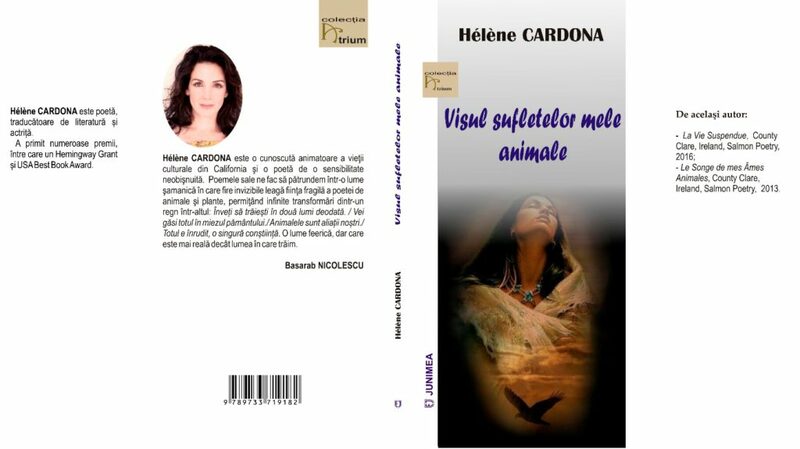 A Romanian translation of Dreaming My Animal Selves was published by Junimea Editions in 2016. 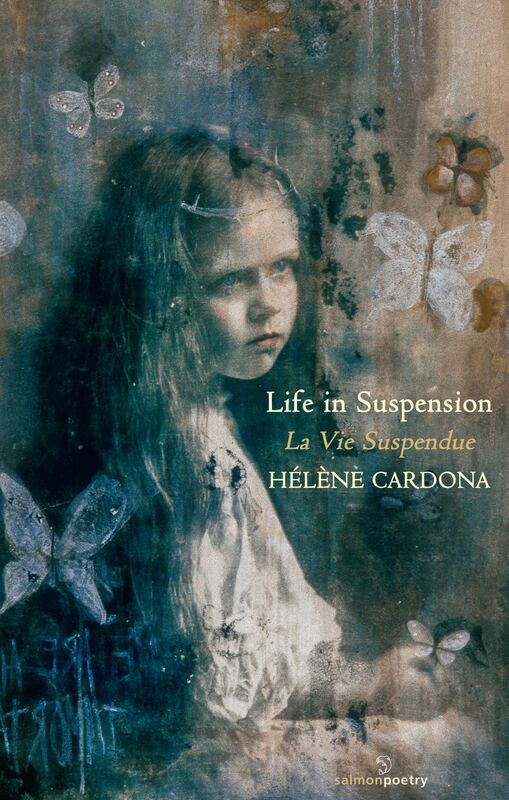 Hélène Cardona is a poet, literary translator and actor, the recipient of numerous awards and honors including a Hemingway Grant and the USA Best Book Award. Her books include three bilingual poetry collections, most recently Life in Suspension (Salmon Poetry, 2016), and Dreaming My Animal Selves (Salmon Poetry, 2013); and two translations: Beyond Elsewhere (White Pine Press, 2016), and Ce que nous portons (Éditions du Cygne, 2014). She also translated Walt Whitman’s Civil War Writings for the Iowa International Writing Program’s WhitmanWeb. 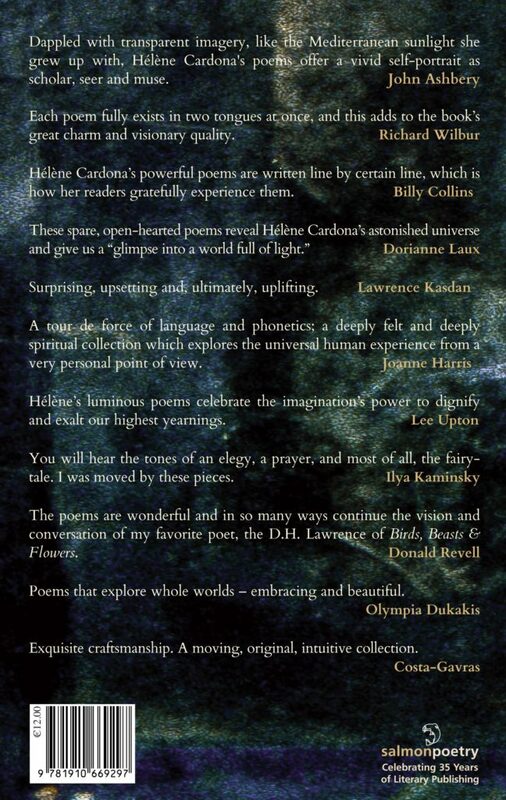 She co-edits Fulcrum: An Anthology of Poetry and Aesthetics, is Co-International Editor of Plume, Essay contributor to The London Magazine, and co-producer of the documentary Pablo Neruda: The Poet’s Calling. She holds a Master’s in American Literature from the Sorbonne, taught at Hamilton College & Loyola Marymount University, and received fellowships from the Goethe-Institut & Universidad Internacional de Andalucía. Publications include Washington Square, World Literature Today, Poetry International, The Irish Literary Times, Dublin Review of Books, The Warwick Review & elsewhere. Hélène had roles in Chocolat, Jurassic World, The Hundred-Foot Journey, Dawn of the Planet of the Apes, X-Men: Days of Future Past, Mad Max: Fury Road, and Mumford. For Serendipity she co-wrote with director Peter Chelsom & composer Alan Silvestri the song Lucienne, which she also sang. She is the Computer Voice in the TV series Heroes Reborn.